1610 Avenue S. Photo: CityLand. Board rules that excavation and foundation work completed prior to permit revocation is still considered in vested rights analysis if revocation is later rescinded. 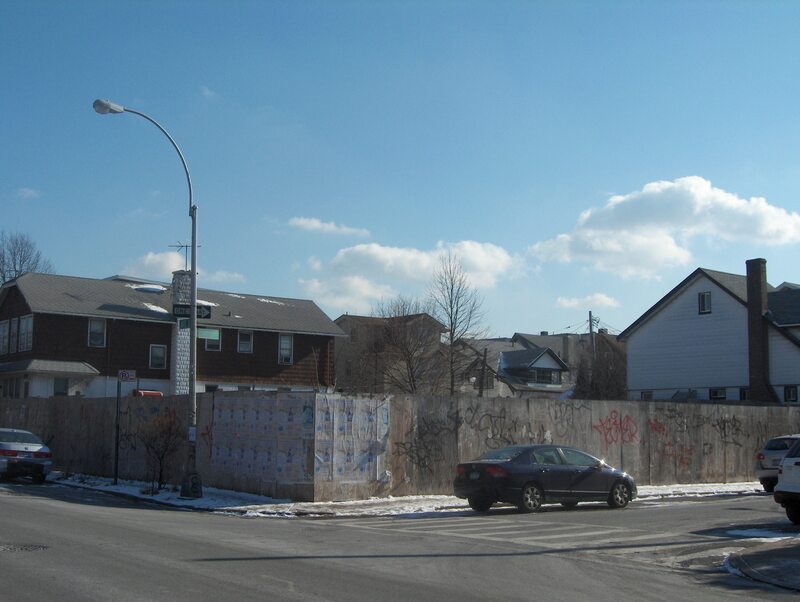 On January 11, 2006, the Department of Buildings issued a permit to the owner of 1610 Avenue S to construct a six-story 25-unit residential building with community facility use on the first floor. After a special audit review, Buildings notified the owner of its intent to revoke the permit unless certain zoning and Building Code objections were resolved. Though the owner completed excavation and began work on the foundation, it failed to resolve the objections, and Buildings revoked the permit on February 14, 2006. The next day, the City Council approved a rezoning in Homecrest which changed the zoning on the owner’s lot from R6 to R4-1. The owner eventually resolved all the objections, and Buildings rescinded all outstanding letters of intent to revoke; however, the zoning change caused the proposed development to be out-of-compliance, and the owner filed an appeal with BSA to complete construction. Elected officials, Brooklyn Community Board 15, and the Madison-Marine-Homecrest Civic Association all opposed the application. They claimed that the owner had not obtained a vested right to complete construction since the excavation and foundation work completed through February 14, 2006 was performed pursuant to an invalid permit. They also argued that substantial construction had not been performed because the east and south walls could not be considered permitted foundation walls since they were shoring walls that would need to be replaced. The opposition also believed that the presence of “shoddy” work allowed BSA to deny the permit, and that the owner’s allegedly false statements about the work performed required BSA to deny the application. BSA disagreed with the opposition, and ruled that the applicant had obtained a vested right to complete construction. Although Buildings had revoked the owner’s permit, BSA found that Buildings’ rescission of the revocation restored the owner’s rights as if they were never taken away, and thus, excavation and foundation work performed prior to the revocation could be counted towards a vested rights analysis. BSA also determined that the amount of work completed at the site amounted to substantial construction even if the east and south walls did not factor into the analysis. Turning to the issue of “shoddy” work, BSA explained that it could not make a decision regarding the adequacy of work performed because such work was within Buildings’ purview. Lastly, BSA declined to consider any argument regarding the owner’s alleged false statements, and reminded the opposition that since BSA was an administrative body, it could not base its decision on principles of equity or fairness.